^ "Limits of Oceans and Seas, 3rd edition". International Hydrographic Organization. 1953. Retrieved February 7, 2010. ^ a b c Stern, R.J., and W.R. Dickinson (2010) The Gulf of Mexico is a Jurassic backarc basin. Geosphere. 6(6):739-754. 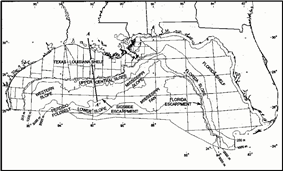 ^ Buffler, R. T., 1991, Early Evolution of the Gulf of Mexico Basin, in D. Goldthwaite, ed., pp. 1-15, Introduction to Central Gulf Coast Geology, New Orleans Geological Society, New Orleans, Louisiana. ^ a b c d Galloway, W. E., 2008, Depositional evolution of the Gulf of Mexico sedimentary basin. in K.J. Hsu, ed., pp. 505-549, The Sedimentary Basins of the United States and Canada, Sedimentary Basins of the World. v. 5, Elsevier, The Netherlands. ^ a b Sawyer, D. S., R. T. Buffler, and R. H. Pilger, Jr., 1991, The crust under the Gulf of Mexico basin, in A. Salvador, ed., pp. 53-72, The Gulf of Mexico Basin: The Geology of North America, v. J., Geological Society of America, Boulder, Colorado. 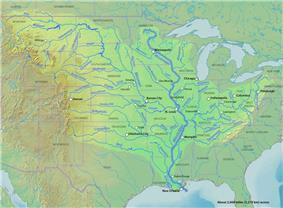 ^ "Gulf of Mexico Watershed". EPA.gov. Retrieved 2010-12-06. ^ "National Water Program Guidance: FY 2005". epa.gov. Retrieved January 21, 2007. ^ "Gulf of Mexico". Handbook of Texas Online. Texas State Historical Association. Retrieved June 26, 2010. ^ "Warm Waters Provide Fuel for Potential Storms". ^ "Central Florida Feels Quake". Retrieved December 27, 2006. ^ "Mexico’s Attempt to Extend its Continental Shelf Beyond 200 Nautical Miles Serves as a Model for the International Community, Mexican Law Review, Volume V, Number 2, Jan.– June 2013". ^ Minerals Management Service Gulf of Mexico OCS Region (November 2006). "Gulf of Mexico OCS Oil and Gas Lease Sales: 2007-2012. Western Planning Area Sales 204, 207, 210, 215, and 218. Central Planning Area Sales 205, 206, 208, 213, 216, and 222. Draft Environmental Impact Statement. Volume I: Chapters 1-8 and Appendices". 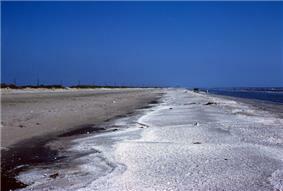 U.S. Department of the Interior, Minerals Management Service, Gulf of Mexico OCS Region, New Orleans. page 3-27 - 3-34 PDF. ^ Zongker, Brett (July 21, 2010). 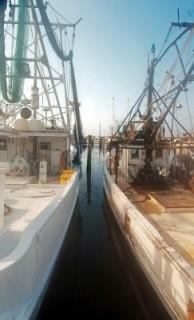 "Smithsonian Holdings to Aid Researchers in the Gulf". Associated Press. Retrieved July 29, 2010. ^ Coddington, Jonathan (June 15, 2010). "Testimony to the Subcommittee on Insular Affairs, Oceans and Wildlife; Committee on Natural Resources; U.S. House of Representatives". [Smithsonian Ocean Portal]. Retrieved July 29, 2010. ^ Thomas, Peter; Md Saydur Rahman (2012). "Extensive Reproductive Disruption, Ovarian Masculinization and Aromatase Suppression in Atlantic Croaker in the Northern Gulf of Mexico Hypoxic Zone". Proceedings of the Royal Society B-Biological Sciences 279 (1726): 28–38. 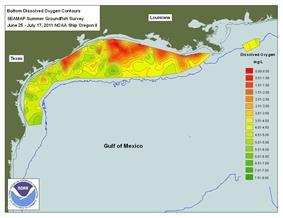 The Smithsonian Institution Gulf of Mexico holdings are expected to provide an important baseline of understanding for future scientific studies on the impact of the Deepwater Horizon oil spill. In Congressional testimony, Dr. Jonathan Coddington, Associate Director of Research and Collections at the Smithsonian’s National Museum of Natural History, provides a detailed overview of the Gulf collections and their sources which Museum staff have made available on an online map. The samples were collected for years by the former Minerals Management Service (renamed the Bureau of Ocean Energy Management, Regulation and Enforcement) to help predict the potential impacts of future oil/gas explorations. Since 1979, the specimens have been deposited in the national collections of the National Museum of Natural History. On 13 December 2007, Mexico submitted information to the Commission on the Limits of the Continental Shelf (CLCS) regarding the extension of Mexico's continental shelf beyond 200 nautical miles. Mexico sought an extension of its continental shelf in the Western Polygon based on international law, UNCLOS, and bilateral treaties with the United States, in accordance with Mexico’s domestic legislation. On 13 March 2009, the CLCS accepted Mexico’s arguments for extending its continental shelf up to 350 NM into the Western Polygon. Since this would extend Mexico’s continental shelf well into territory claimed by the United States, however, Mexico and the U.S. would need to enter a bilateral agreement based on international law that delimits their respective claims. Mexico and United States of America: Treaty to resolve pending boundary differences and maintain the Rio Grande and Colorado River as the international boundary, of November 23, 1970; Treaty on maritime boundaries between the United States of America and the United Mexican States (Caribbean Sea and Pacific Ocean), of May 4, 1978, and Treaty between the Government of the United States of America and the Government of the United Mexican States on the delimitation of the continental shelf in the Western Gulf of Mexico beyond 200 nautical miles (370 km), of June 9, 2000. Cuba and United States of America: Maritime boundary agreement between the United States of America and the Republic of Cuba, of December 16, 1977. In 1517, Old World; they also had reason to expect that this new land would have gold. All of this encouraged two further expeditions, the first in 1518 under the command of Juan de Grijalva, and the second in 1519 under the command of Hernán Cortés, which led to the Spanish exploration, military invasion, and ultimately settlement and colonization known as the Conquest of Mexico. Hernández did not live to see the continuation of his work: he died in 1517, the year of his expedition, as the result of the injuries and the extreme thirst suffered during the voyage, and disappointed in the knowledge that Diego Velázquez had given precedence to Grijalva as the captain of the next expedition to Yucatán. Northeast Gulf of Mexico, which extends from just east of the Mississippi Delta near Biloxi to the eastern side of Apalachee Bay. Campeche Bank, which extends from the Yucatan Straits in the east to the Tabasco–Campeche Basin in the west and includes Arrecife Alacran. In 2002 geologist Michael Stanton published a speculative essay suggesting an impact origin for the Gulf of Mexico at the close of the Permian, which could have caused the Permian–Triassic extinction event. However, Gulf Coast geologists do not regard this hypothesis as having any credibility. Instead they overwhelmingly accept plate tectonics, not an asteroid impact, as having created the Gulf of Mexico as illustrated by papers authored by Kevin Mickus and others. This hypothesis is not to be confused with the Chicxulub Crater, a large impact crater on the coast of the Gulf of Mexico on the Yucatan Peninsula. To the east, the stable Florida platform was not covered by the sea until the latest Jurassic or the beginning of Cretaceous time. The Yucatan platform was emergent until the mid-Cretaceous. After both platforms were submerged, the formation of carbonates and evaporites has characterized the geologic history of these two stable areas. Most of the basin was rimmed during the Early Cretaceous by carbonate platforms, and its western flank was involved during the latest Cretaceous and early Paleogene periods in a compressive deformation episode, the Laramide Orogeny, which created the Sierra Madre Oriental of eastern Mexico. Geologists and other Earth scientists agree in general that the present Gulf of Mexico basin originated in Late Triassic time as the result of rifting within Pangea. The rifting was associated with zones of weakness within Pangea, including sutures where the Laurentia, South American, and African plates collided to create it. First, there was a Late Triassic-Early Jurassic phase of rifting during which rift valleys formed and filled with continental red beds. Second, as rifting progressed through Early and Middle Jurassic time, continental crust was stretched and thinned. This thinning created a broad zone of thick transitional crust, which displays modest and uneven thinning with block faulting, and a broad zone of uniformly thinned transitional crust, which is half the typical thickness, 35 kilometers, of normal continental crust. It was at this time that tectonics first created a connection to the Pacific Ocean across central Mexico and later eastward to the Atlantic Ocean. 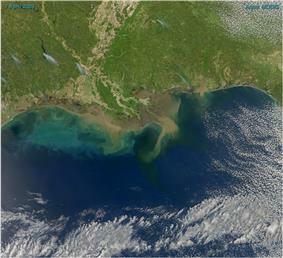 This flooded the subsiding basin created by rifting and crustal thinning to create the Gulf of Mexico. While the Gulf of Mexico was a restricted basin, the subsiding transitional crust was blanketed by the widespread deposition of Louann Salt and associated anhydrite evaporites. 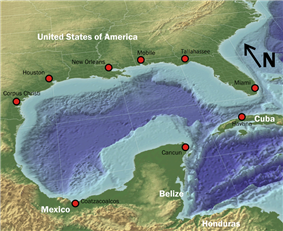 Initially, during the Late Jurassic, continued rifting widened the Gulf of Mexico and progressed to the point that sea-floor spreading and formation of oceanic crust occurred. At this point, sufficient circulation with the Atlantic Ocean was established that the deposition of Louann Salt ceased. The consensus among geologists who have studied the geology of the Gulf of Mexico, is that prior to the Late Triassic, the Gulf of Mexico did not exist. Before the Late Triassic, the area now occupied by the Gulf of Mexico consisted of dry land, which included continental crust that now underlies Yucatan, within the middle of the large supercontinent of Pangea. This land lay south of a continuous mountain range that extended from north-central Mexico, through the Marathon Uplift in West Texas and the Ouachita Mountains of Oklahoma, and to Alabama where it linked directly to the Appalachian Mountains. 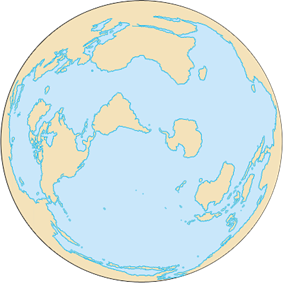 It was created by the collision of continental plates that formed Pangea. As interpreted by Roy Van Arsdale and Randel T. Cox, this mountain range was breached in Late Cretaceous times by the formation of the Mississippi Embayment. A line joining Cape Catoche Light () with the Light on Cape San Antonio in Cuba, through this island to the meridian of 83°W and to the Northward along this meridian to the latitude of the South point of the Dry Tortugas (24°35'N), along this parallel Eastward to Rebecca Shoal (82°35'W) thence through the shoals and Florida Keys to the mainland at eastern end of Florida Bay, all the narrow waters between the Dry Tortugas and the mainland being considered to be within the Gulf.